Simply plugs into existing port behind the front panel of newer pioneer brand mini split systems heat pumps. Provides the ability to remotely access the air conditioning system, setup and update programmed operational modes (daily and Weekly programming options), monitor the conditions. It uses the existing 2.4 Ghz home wireless internet system. Module is self powered and fully compatible with Alexa and Google voice. Free downloadable application for iPhone and Android operating systems. Cloud based data storage and usage reporting abilities. Manufacturer: Parker Davis HVAC International, Inc. Publisher: Parker Davis HVAC International, Inc. Studio: Parker Davis HVAC International, Inc. 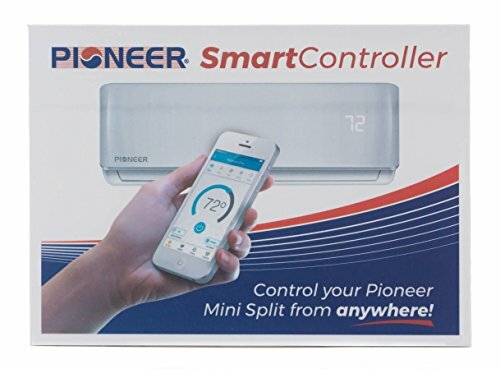 If you have any questions about this product by PIONEER Air Conditioner, contact us by completing and submitting the form below. If you are looking for a specif part number, please include it with your message. EZ-AC Air-Conditioner Security Window Lock Wedge (Made in the U.S.A.) Extends 7 1/2"-14"